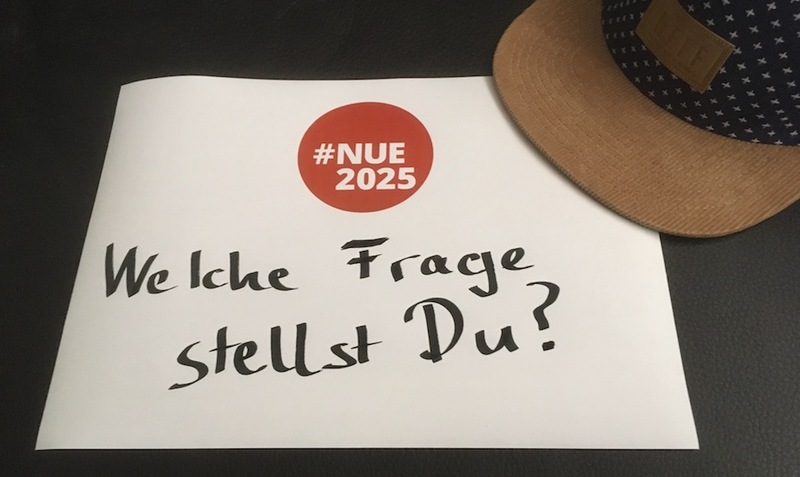 Bei #NueFragt stellst Du Deiner Stadt eine Frage. Wir sind ebenso gespannt, wie Du, welche Dynamik sie entwickelt, wer welche Antwort gibt. Ob die Leute sich trauen, eine Antwort zu geben. Doch allein die Frage ist etwas wert. Wir alle gemeinsam regen zum Nachdenken an. Kleine Videos lassen die Fragen durch die sozialen Medien wandern. Wenn Du möchtest, greif eine von den von uns gesammelten Fragen auf (Instruktionen und Beispielfragen kannst findest Du im 2-Seiter zu #NueFragt). Oder Du überlegst Dir selbst eine Frage, die etwas mit einem Ort oder der Kultur in der Stadt zu tun hat. Die Frage darf provokant sein, sie darf einfach oder schwierig sein. Lass Deiner Kreativität freien Lauf. Nimm ein großes Blatt Papier mit unserem Logo. Am besten ein festes Papier, wir haben gute Erfahrungen mit dem A4-Format gemacht. Du kannst Dir unser Logo mit dieser Datei ausdrucken (ähnlich dem Foto zu diesem Beitrag). Nimm einen dicken Stift (z.B. Permanent-Marker) und schreibe Deine Frage auf das Papier. Suche Dir einen schönen Ort Deiner Wahl. Filme hier mit dem Handy, der Webcam Deines Notebooks oder einer anderen Kamera, wie Du das Blatt mit der Frage in die Luft hälst und stell die Frage auch laut an das Publikum. Es reicht, wenn ein wenig vom Ort und die Frage erkennbar ist, wenn Du möchtest, kannst Du natürlich auch im Bild sein. Poste das Video auf Social Media und tagge es mit #NueFragt. Leite sie an ein paar Freunde oder tagge die Freunde, damit sie die Frage beantworten und weiterverteilen können. Sprich über die Aktion und begeistere weitere zum Mitmachen. Können die Videos auch in anderen Sprachen gedreht werden? Ja, unbedingt! Es gibt nichts tolleres, als wenn viele diese Fragen verstehen und wenn die Videos die große Breite unserer bunten Stadtkultur widerspiegeln. In welchem Format muss das Video sein? Idealerweise nutze ein gängiges Format für Social Media. Meist ist Querformat besser geeignet. Letztlich kannst Du jedes Format nehmen, dass sich verteilen lässt. Die Qualität sollte gut genug sein, dass man die Frage lesen und auch akustisch verstehen kann. Du hast eine andere Frage zur Aktion? Schick uns einfach kurz eine Email an nuefragt@nue2025.eu und wir beantworten sie. Wenn wir sie für allgemein halten, ergänzen wir diese Seite. Frage die Stadt, was sie bewegt! What do you ask yourself and your fellow citizens regarding the city, culture, the European Capital of Culture application or everyday life in our metropolis? We are as curious as you are about the dynamics the question will develop and about who will answer and what. Will people dare to reply? Well, the question itself is valuable. All of us together will ignite further thinking and reflection. Small videos will wander through social media. We would like to better understand what moves you. We would like to know more about our city and our relation to it. Questions stimulate, open topics and thoughts. They enable us to create small triggers and impulses for many many people. We will post little videos starring a sheet with a question. We will share them on social media. The videos should be created by diverse people at different places. 30 seconds suffice. Your phone is the only tool you need. Share the video on social media and tag it with #NueFragt. If you like, you can also email it to nuefragt@nue2025.eu. We will share it in our network, you share it with your friends. Our joint message will then travel the infinite net in form of a question. If you like, use one of the questions we collected (instructions and exemplary questions are available in this two-pager). Or you think of a question yourself. The question should be related to a place or culture in our city. It may well be provocative, it may be easy or difficult. Let loose your creativity. Take a big sheet of paper with our logo. It’s best to have a strong paper and we have good experience with a heavy A4 sheet (160g or more). You can download a file with our logo (similar to the one used for the photo in this post). Use a thick marker and write your question on the paper. Use your mobile phone, web cam or other camera to film how you hold the paper. Do ask the question aloud to our virtual audience. It is sufficient if the place and the question are visible, you can choose yourself whether you want to show your face. Post the video on social media and tag it with #NueFragt. Forward the video to friends or tag them, so they can answer the question and/or forward the video. Talk about the campaign and animate others to take part. Talk about the campaign and motivate others to collaborate! Can the videos also be in a foreign language? Absolutely! It’s awesome that many different people understand the question and that the videos reflect the diversity of our colourful city culture. What’s the optimal video format? Ideally, you use a format common for social media. Landscape is usually better suited than portrait, the file format depends on what you can upload (if you directly upload from the phone, the device will generally take care of any necessary conversions automagically). The quality should be sufficient to be able to read the question and to understand the spoken words well. Do you have other questions regarding the campaign? Feel free to drop us a line at nuefragt@nue2025.eu and we will answer you. If we deem it a question of general interest, we will amend this page. Ask the city what moves it!